Japan is poised to launch its second-ever unmanned cargo vessel to the International Space Station early Saturday morning (Jan. 22). The vessel, which was initially scheduled to launch Thursday (Jan 20), was delayed due to poor weather forecasts. The spacecraft, called Kounotori 2 ("Kounotori" is Japanese for "white stork"), is slated to lift off from Japan's Tanegashima Space Center at 12:37 a.m. EST (0537 GMT, or 2:37 p.m. local time in Japan). The cargo ship will launch atop Japan's H2B rocket, according to the Japanese space agency JAXA. If everything goes according to plan, Kounotori 2 will arrive at the station on Jan. 27, delivering 5.3 tons of food, supplies and spare parts. The mission will be the second for JAXA's unmanned space cargo ship program, which had a successful maiden run to the station with its Kounotori 1 vessel in September 2009. The Kounotori craft are officially known as H-2 Transfer Vehicles (HTVs). 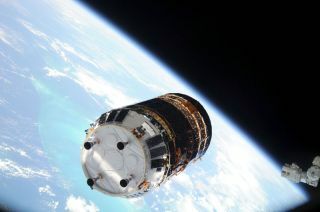 The name Kounotori was given after the first HTV flight to signify the delivery of happiness, JAXA officials said. Japan's Kounotori freighters — along with European and Russian robotic cargo ships —play a large role in ferrying supplies to the space station in the future, NASA officials have said. The U.S. space agency will also rely on commercial craft under development by private companies such as SpaceX and Orbital Sciences for future deliveries. NASA plans to retire its space shuttle fleet, a chief station supplier, later this year. "After the space shuttle is retired, the HTV will be the only vehicle that is capable of transporting large-scale maintenance equipment vital for sustaining the ISS," JAXA's Yoshihiko Torano, HTV project manager, said in a statement. "Thus it will be an indispensable spaceship for the operation of the ISS." Japan's second robotic HTV cargo ship, the Kounotori 2, is prepared for its Jan. 22, 2011 launch from the country's Tanegashima Space Center by the Japan Aerospace Exploration Agency. Here, the craft's unpresurrized cargo section is shown. Kounotori is a shiny, gold-colored cylinder about 33 feet long (10 meters) by 14 feet wide (4.4 m). It can haul up to 6 tons of pressurized and unpressurized cargo to the station, but it will be carrying about 5.3 tons on this trip, JAXA officials said. That payload will include drinking water, food and racks for scientific experiments, as well as a pallet loaded with spare parts for the station. In the early morning hours of Jan. 27, the spacecraft will approach the station, coming to within about 33 feet (10 m) of it. At that point, astronauts Cady Coleman and Paolo Nespoli will use the space station's Canadarm2 robotic arm to snag the cargo vessel and attach it to the station's Harmony module. NASA plans to broadcast this operation — along with the Jan. 22 launch — live on NASA TV, officials said. The cargo vessel will remain attached to the station for about 40 days. It will be filled with trash, then detached at the end of March to burn up in Earth's atmosphere, officials said. "Kounotori has a one-way ticket," Japanese astronaut Akihiko Hoshide said in a recent JAXA video. "It can bring supplies to ISS, but is unable to bring anything back to the Earth." However, JAXA officials have said that the HTV program could help pave the way for more ambitious, manned round-trip missions in the future. "I hope Japan will embark on new manned space activities using technologies from Kounotori," Torano said.